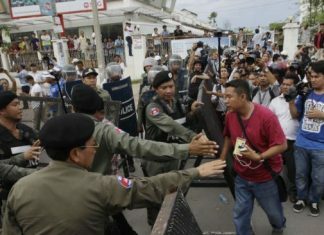 Election observers on Wednesday released a joint statement regarding the fallout from the disputed national election, calling for a recount of votes in Kandal province’s Takhmao City, where a particularly large number of irregularities were reported. The Situation Room, a conglomerate of NGO’s and election monitors established to oversee the July 28 poll, found more than 10,000 ir­regularities across the nation but were especially alarmed by reports from Kandal province, where Prime Minister Hun Sen was the CPP’s No. 1 candidate for a seat in the National Assembly. “The irregularities in Kandal prov­ince are very concerning, especially from polling station number 1204 in Sa’ang district’s Sa’ang Phnom commune, [which] was closed before the [3 p.m.] deadline,” reads the statement, adding that no 1108 form, on which vote counts were recorded, was lodged from a separate polling station in Takhmao City. NEC Secretary-General Tep Nytha repeated Wednesday that the NEC was no longer involved in the complaints process. The joint statement said that 48 percent of the 10,000 irregularities on election day were cases where people had arrived at polling booths ready to cast their vote but were unable to do so, primarily because of names missing from the voter list or incorrect data on identification documents. The opposition CNRP has rejected preliminary election results which show the ruling CPP taking 68 parliamentary seats to the CNRP’s 55. The CNRP has alleged massive electoral fraud and claims that it actually won the ballot. The opposition has asked for an independent investigation into ir­regularities and threatened mass protests if they are not forthcoming. This has led to a buildup of police and military in and around Phnom Penh, another issue addressed by the Situation Room on Wednesday. “[We] would like to request that the government withdraw armed forces and weapons, which had been deployed to intimidate people,” the statement reads.